Lake Suigetsu is a small lake in Japan which is often used by Old Earth believers to try to disprove the Young Earth timescale. They say that Lake Suigetsu has a continuous record of varves (fine laminations deposited annually) in the sediment below the lake for the last 100,000 years or so. 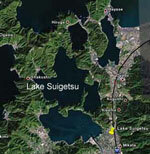 Here’s Glenn Morton’s description of Lake Sugetsu. One person I debated recently claimed that Lake Suigetsu disproves the Book of Genesis as a historical record. But does it really? Or is this just one more false claim put forth by anti-creationists? 1) INCREASING RECOGNITION THAT MANY “VARVES” ARE NOT ANNUAL LAMINATIONS AFTER ALL. Quigley, R. M, Glaciolacustrine and glaciomarine clay deposition: a North American perspective; in: Eyles, N., editor, Glacial geology—an introduction for engineers and earth scientists, Pergamon Press, New York, p. 151, 1983. 1997 Kluwer Academic Publishers. Printed in Belgium. Read the entire paper for free HERE. 3) IF LAKE SUIGETSU LAMINATIONS ARE ANNUAL, THEN WHY ARE THEY NOT FORMING TODAY? And it is clear (if you actually read the relevant science papers as I have) that they are not, though many Old Earth advocates assume that they are. There are two key papers which tell us this: A 40,000-year varve chronology from Lake Suigetsu, Japan: extension of the 14 C calibration curve, H Kitagawa, J van der Plicht – Radiocarbon, 1998 – radiocarbon.org, and Survival strategy of diatom species living on now-depositing non-glacial varves, M Kato, Y Tanimura, H Fukusawa – Quaternary International, 2004 – Elsevier. Kitagawa begins his varve counting back around 1664 and earlier around the time of the earthquake and Kato counts her ‘varves’ from 1729 and before. Some people have claimed that the varves stopped forming in 1664 when the canal was built because of the influx of saltwater to a formerly freshwater lake. But if this is true, why does Kato assert that varves were still forming up until 1729? The answer, in my opinion, is that the ‘varves’ in Lake Suigetsu are not all true varves, that is annual laminations. Probably there have been some annual laminations, but it is more likely that the Suigetsu laminations are similar to the Third Sister Lake laminations in that several laminations are laid in any given year. In wet years, more laminations were probably laid and in dry years less. 4) SUIGETSU LAMINATIONS ARE NOT WHAT ONE WOULD EXPECT FROM STILL WATER DEPOSITION. Glenn Morton has obtained a close up picture (at right) of the laminations. Notice that some of the laminations begin and end in the picture. This is important because it indicates that these laminae were probably laid by turbidity currents, not by still water deposition. 5) KATO’S SEDIMENT CORE AND KITAGAWA’S CORE DO NOT MATCH UP … THEYR’E NOT EVEN CLOSE. Kitagawa analyzed several cores, one of them SG2, a piston core, which was also later analyzed by Kawakami (A new opportunity to detect paleo-earthquake events dating back to the past 10 millennia: a record, S Kawakami, H Fukusawa, Y Kanaori – Engineering Geology, 1996 – Elsevier). Kato analyzed a different core, SGP-12 (see citation above). Kato claims that the 1662 earthquake layer is at ~102cm below the top of her core while Kitagawa puts his 1662 earthquake layer at ~29cm, roughly a 70 cm difference. Remember, we’re talking about two cores taken from the same lake fairly close to one another. Does this much variation over such a small area speak of slow, steady, annual deposition? To me, it does not. To me it argues strongly for episodic deposition driven by periodic heavy rains and even an occasional tsunami or earthquake. Japan is an extremely earthquake-prone country. WHAT ABOUT KITAGAWA’S CARBON 14 DATING? Kitagawa’s carbon 14 dating appears to support the idea that the Suigetsu laminations are an annual record from ~7000 YBP to ~35000 YBP (Years Before Present). However, AMS testing of leaf samples such as those submitted by Kitagawa only uses a very small portion of the leaf to obtain a date (typically 1/500th portion of the leaf). Also, AMS labs generally know what date they are shooting for prior to doing the test (i.e. the tests are generally not blind-see links below). Also, dates are typically either rejected or explained away if they do not meet the expectations of the researchers. So my question is, “Did Van Der Plicht’s AMS lab (who did Kitagawa’s tests) reject several small leaf bits as they were testing each leaf until they hit on one that roughly matched the ‘varve age’ that they were given beforehand?” I see no reason why they would not have, given the knowledge we have about radiometric dating practices. See THIS DISCUSSION and THIS ONE for further info on this topic. I have e-mailed with Dr. Van der Plicht to investigate this, but have not received an answer yet. I know my contact info is good because he did send me some general info on radiometric dating. ARE THERE ANY LAKES WHICH ARE ‘VARVING’ UP TO THE PRESENT DAY? Yes, but probably not many. Lake Baldeggerse is one such lake. See discussion HERE. In this discussion, note that “Lasting Damage” (AKA Jet Black, a PhD physicist with whom I dialog alot) says “Note here that dave has been explicitly told that the coring methods used by Kato and Kitagawa are piston cores, which would damage the highest sediments which are soft and unconsolidated.” While it is true that Jet Black claimed this, he has not presented evidence that his claim is true. Also, he told me this first when he was under the mistaken impression that Kitagawa’s core was taken with a drill corer, not a piston corer. Piston cores may cause some damage, but probably not much and since both researchers used the same type of equipment, we should expect similar results. Contrary to firm declarations from Old Earth Advocates that Lake Suigetsu ‘disproves the Genesis timescale’ or that it supports an Old Earth, the evidence favors episodic deposition of laminations. Probably the majority of the laminations were laid during the year of the Global Flood of Noah, with much of the balance being laid during the ensuing Ice Age and the Global Warmup and Melt which followed that several hundred years later. This whole period would also have been a period of readjustment of the earth and we would expect much more frequent earthquakes, tsunamis, volcanoes and such to have occurred during this time. Lake Suigetsu seems to fit well within the Flood paradigm. My friend Jet Black’s most recent summary post (4/6/08) on this topic can be found HERE. This entry was posted on Friday, April 11th, 2008 at 6:49 am and is filed under Creation/Evolution, Genesis Flood. You can follow any responses to this entry through the RSS 2.0 feed. You can leave a response, or trackback from your own site. I failed to open comments when I first published this article. Sorry. Now they are open.